First, I want to thank my growing followers despite my long absence. It’s been a while since I’ve posted a recipe; I’ve been traveling a lot, to Seoul, L.A., Honolulu/Maui and Cleveland (my husband’s hometown). 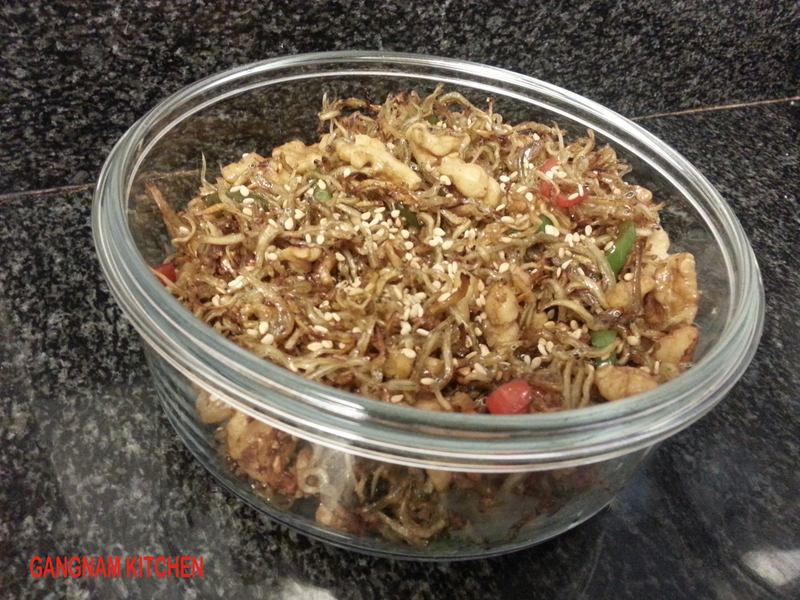 Today, I decided to start with one of my favorite banchans (반찬, side dishes), myulchi-bokkeum (멸치볶음). Myulchi (멸치) are dried anchovies that come in various sizes and used in many different ways, usually the large ones for myulchi broth and the small ones cooked as banchans (side dish). Myulchi are a nutritious food, high is calcium and protein as well as omega-3, DHA and EPA, especially great for children because it helps growth, brain development and memory. I added nuts to add even more nutrition but adding nuts also cuts the salt. You can add any nuts you may have at home, such as almonds, walnuts, pine nuts or peanuts. 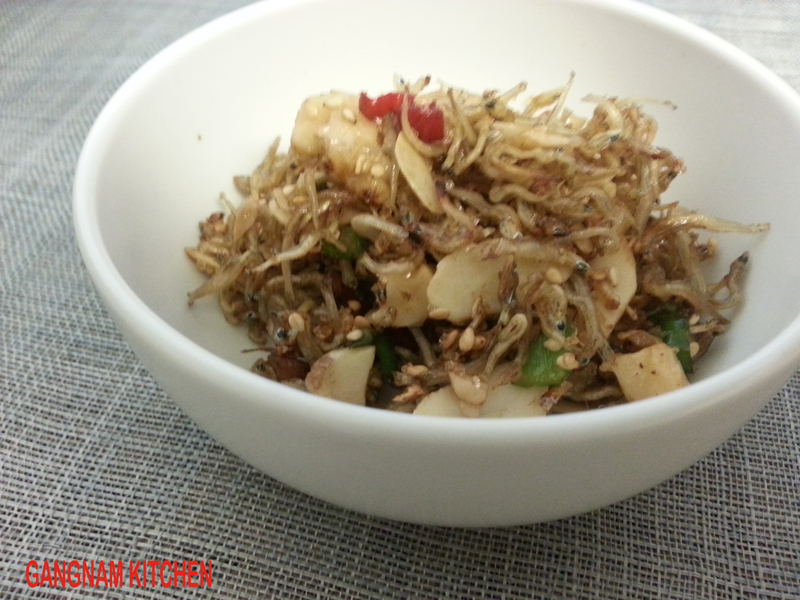 I especially like this dish because it is not only healthy, but it is easy and quick to make. It takes me only about 15-20 minutes and lasts a very long time in the refrigerator. 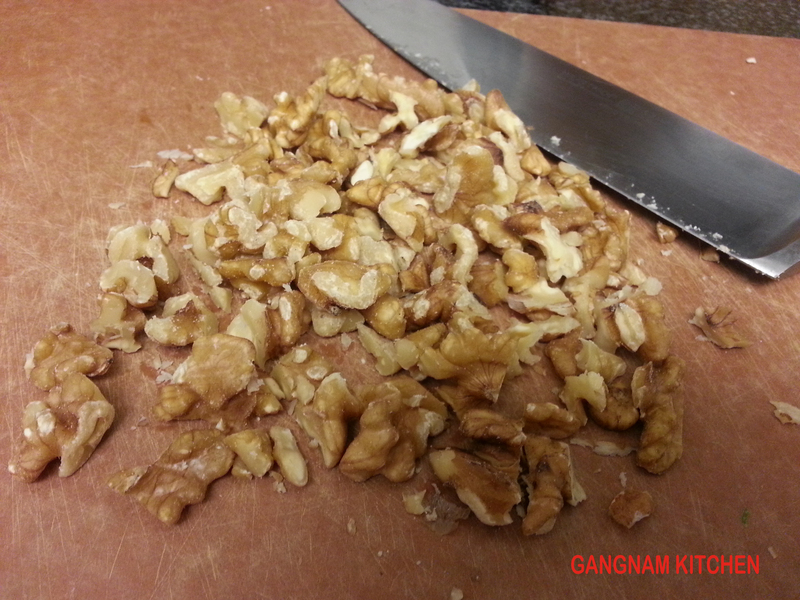 Coarsely chop the nuts if they are large nuts such as walnuts. If you are using peanuts or sliced almonds, you can use them as it is. 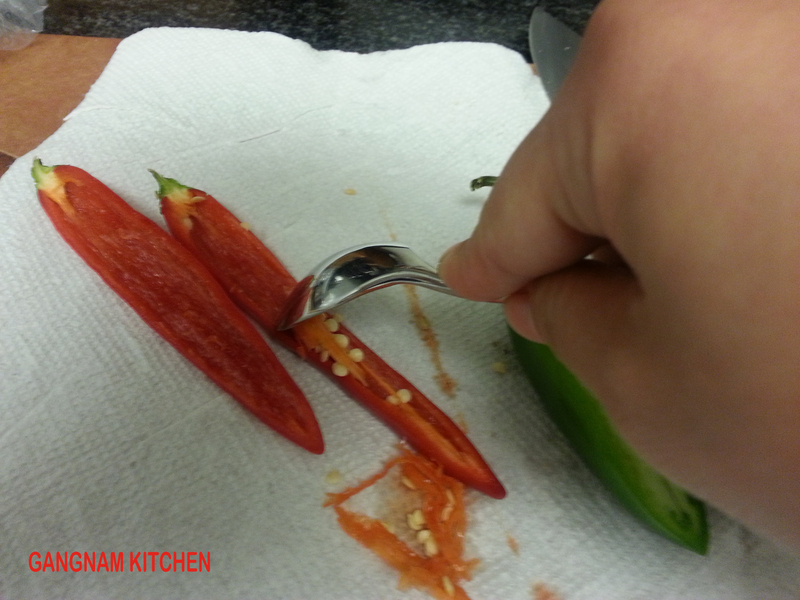 Slice the chilies length wise then scrape out the seeds with a small spoon. Cut into small pieces. 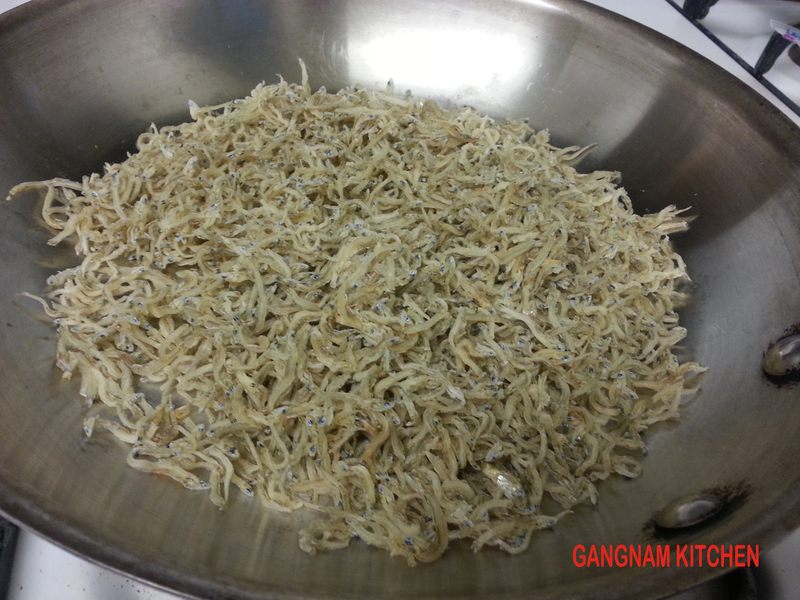 Add the myulchi (멸치, dried anchovies) in a dry pan and sauté on medium-low heat for about 5 minutes. This vaporizes any moisture, gives it a crunch and removes any unpleasant odor. Move the myulchi to a separate plate. 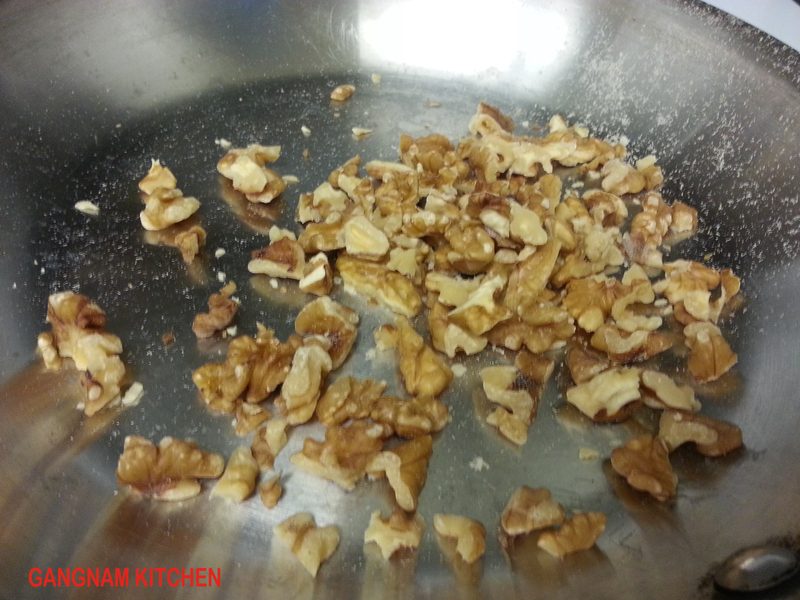 Add the nuts in the same pan and lightly roast them for about 3 minutes. Move the nuts to the same plate as the myulchi. 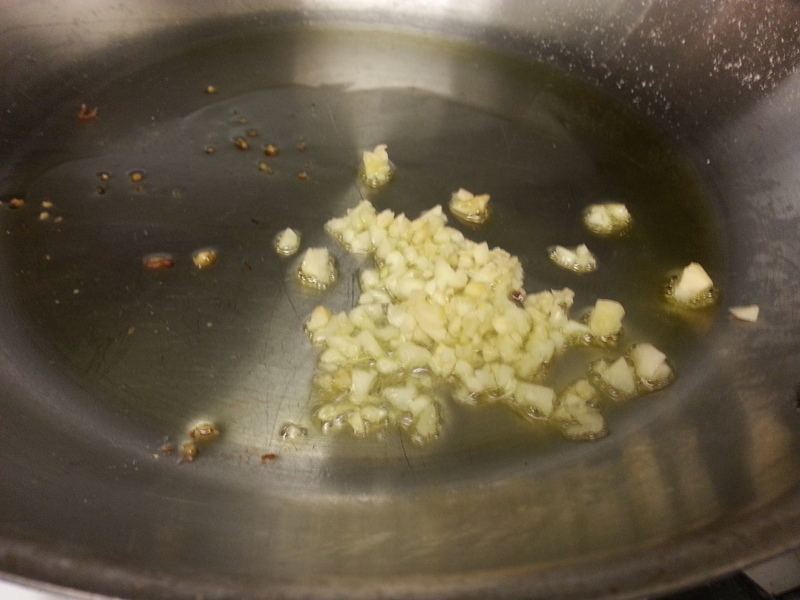 Drizzle the oil into a pan on medium heat, then add the minced garlic. 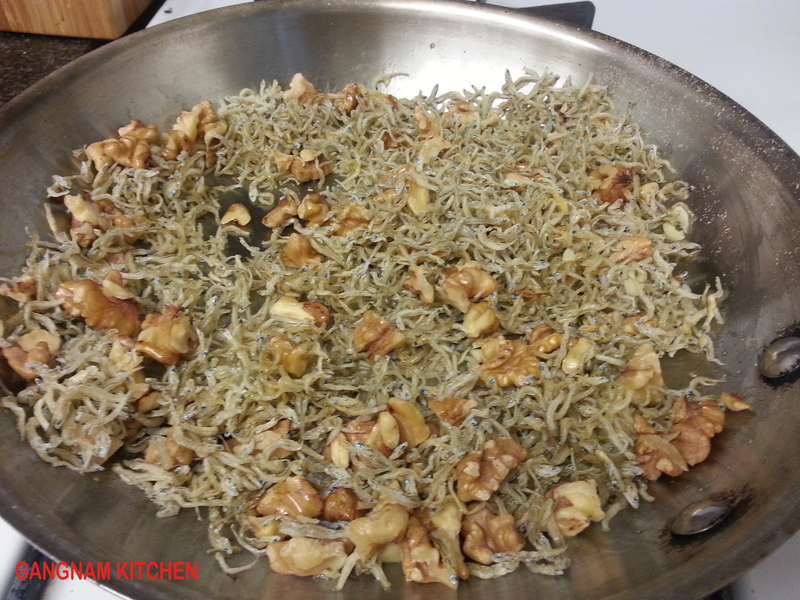 Add the myulchi and nuts to the same pan and sauté for a few minutes. Add the chili peppers, sauté for another minute or so. I used red and green chilies for color and flavor but if you have children who do not like chilies, you can omit them. Mix in about 2/3 of the marinade and quickly mix. Taste and mix in the rest of the marinade if needed. 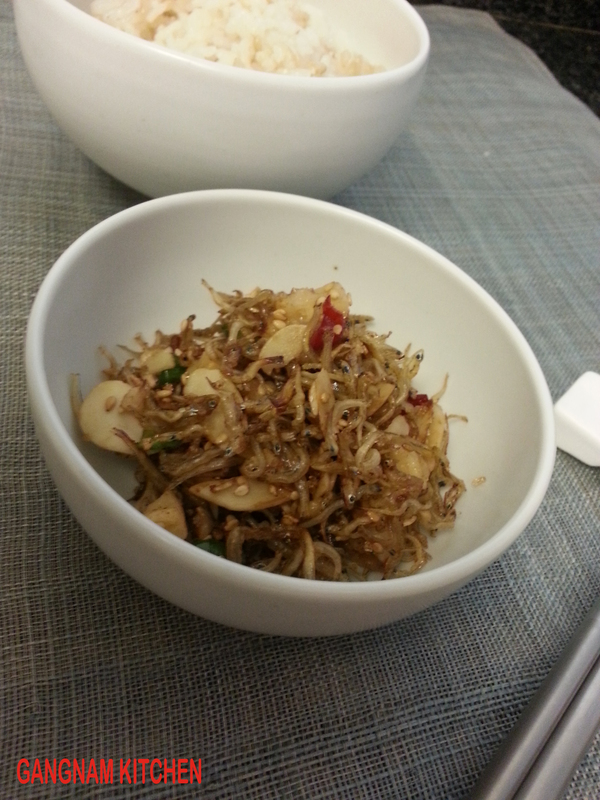 The saltiness of the dish varies depending on the saltiness of the myulchi. I like to add about a tablespoon of turbinado sugar at the end for an extra crunch, but this is optional as well. 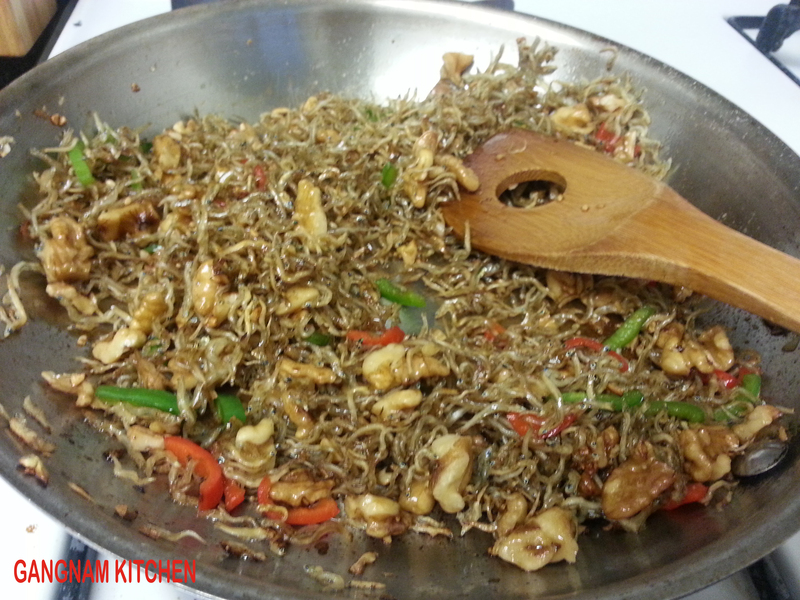 Finish by garnishing with toasted sesame seeds. Cool before storing in the refrigerator. 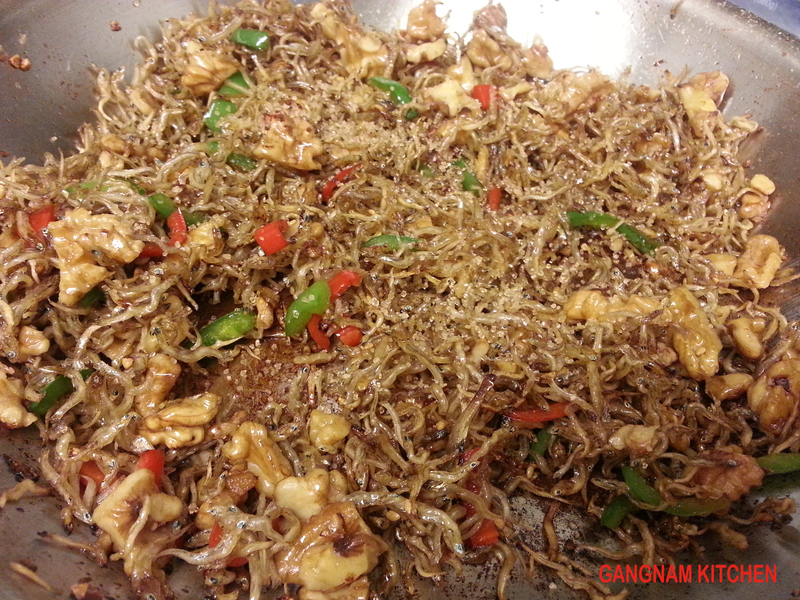 This entry was posted in Banchan (반찬, Side Dish), Good for breakfast, Good for dinner, Good for lunch, Seafood and tagged anchovies, banchan, myulchi, sauté by gangnamkitchen. Bookmark the permalink.